SANDY on duty at the CANTOR JINDAL breakfast this morning! 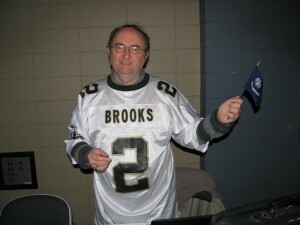 PICTURE of BLOGGER with SAINTS JERSEY with the LOUISIANA GOVERNOR! | Virginia Right! 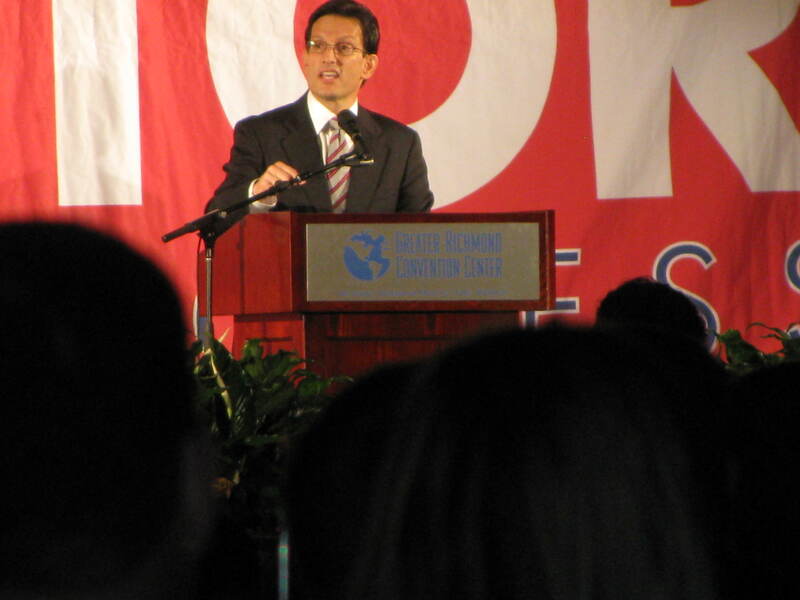 Thanks to Tom White, I was able to attend the Cantor/Jindal breakfast this am! (In fact I am here – already I have been a few feet from my hero, Governor Bobby Jindal) I have gotten a solid, if blurry photo that should be in an update for this blog post. I was invited up by a staff person of Cong. Cantor to come up for a few photos. 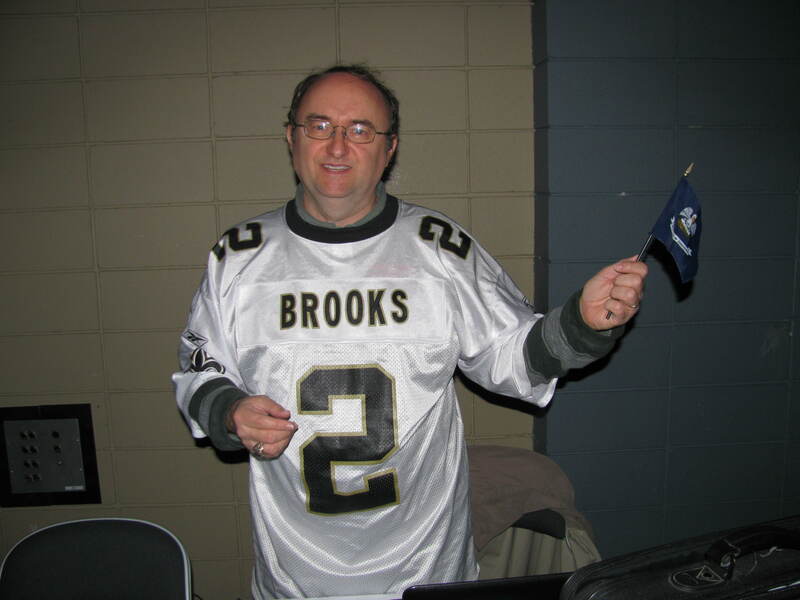 I am also taking the GOP by storm a bit with my unusual attire – a Saints jersey and the very same Louisiana flag I had when I met Governor Jindal in 2009 when he was the guest of Governor McDonnell. 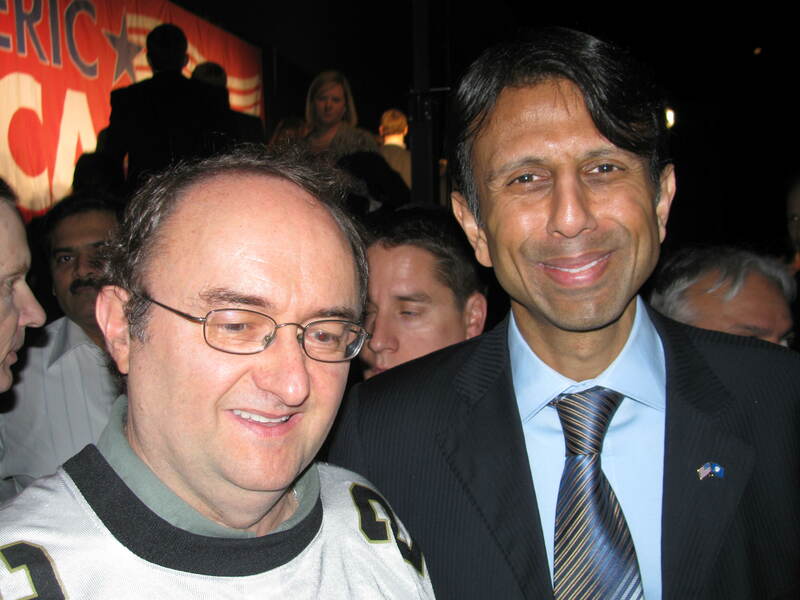 Jindal/McDonnell 2016 is a great ticket for me and perhaps the best chance to retake the White House. (It also would be a first for Sandy: A ticket where I met both candidates!) I want to also thank Marty Ryall, Cong. Cantor’s campaign manager, who made sure my needs were met! Governor Jindal is a health care expert. From his days an an intern for a congressman where he wrote a nice paper on Medicaid, to being appointed a state cabinet officer at 24! Health and Hospitals Secretary! He would be a good choice to best implement Obamacare in the best way as the bill is revised to make it what it’s authors wanted: To provide affordable coverage to all Americans. 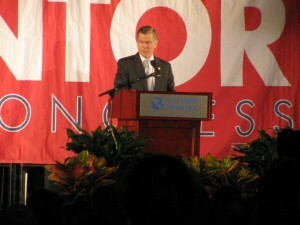 Governor Bob McDonnell is making some introductory remarks in support of both Governor Jindal and Congressman Eric Cantor right now. He just introduced the congressman. Congressman Cantor is speaking now. He has saluted Gov. McDonnell as an innovator in transportation and that Gov. Jindal is an innovator for education. Now Governor Jindal is speaking. He honored Gov. McDonnell as an innovator on taxes. We now have thirty GOP governors! He now honors Cong. Cantor too. Mentions political spouses and Mrs. Cant0r in particular. We must tackle the national debt – it’s too high. 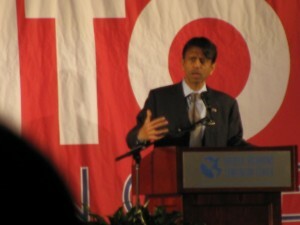 When it comes to health care, Governor Jindal rejects a “one size fits all” approach. but after he speaks to issues I did not know about Medicare (I told you he’s was an expert!) but Jindal turns to education. Governor Jindal has come up with this: Let the dollars follow the child not the child follow the dollars! He wants results. The governor cited an opponent of his educational reforms who said the poor parents did not “have a clue” where to send their kids! He is telling a joke about the governor’s father that was well received! His humor is light but there. Where does the GOP go from here: Not the party of austerity but the party of growth. America is not defined by the federal government or government at all. The debate about which party can best manage the federal government is a debate on our opponent’s terms. A man from Mars might think we are defined by Washington! The states are adjuncts (That’s Jindal’s word!) but that is not true. This government game is the wrong game! Today’s conservatism is defined by zeroes. Let’s take the focus away from the government. Forget balanced budget amendment, etc. Not serious. Senator Obama opposed raising the debt ceiling due to the debt too high – at EIGHT TRILLION, with a T. Now it is a 16 trillion! Cannot give enough money to your green energy friends to grow the economy. Rather grow the US private sector. Not austerity but growth – the party of a prosperous future! If our goal is to manage the growth of government, count me out! the Dems can do that. Margaret Thatcher says – win the debate and then you’ll win the election. Cannot not just point out failures of the other side. That did not win in 2012. “Recalibrate the compass of conservatism”; let us not just be negative! What President Obama calls for it is a failure and does not work. block grants to states – if not appropriate – should government do it. Reform the tax code, remove the loopholes for special interests and make the filing of taxes simple! People should not be fearful of the tax consequences of their decisions. American exceptionalism is great but it is not government that makes the US exceptional! We can be the party of growth. UPDATE: I was invited up by Megan Whittemore to get a picture of Governor Jindal and Cong. 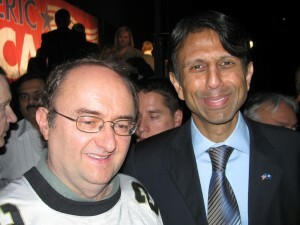 Cantor and the Governor noticed my Saints jersey and I got a picture with perhaps the future President! I told the governor that I admired him very much and he’d be a great President. “I don’t know about that.” he said. Here is the winning photo – of the guy with the Saints jersey who took the breakfast by storm – with the Governor of Louisiana! ← SANDY SANDERS (NOT the Virginia Right blog) endorses DEL. ROB BELL for AG!